Young adult male specimen, neutral mood. 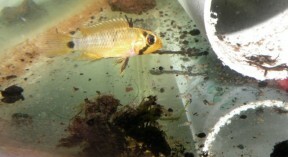 Adult female in broodcare colour pattern with her free-swimming fry. Like some congeners this species lays red eggs. Broodcare may continue for several weeks. 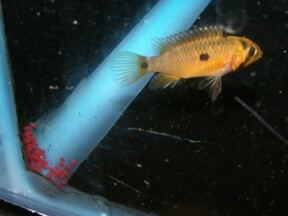 Nuptial female with fry beneath. steindachneri: named for Austrian zoologist Franz Steindachner. Type locality is Georgetown which lies at the mouth of the Demerera River, eastern Guyana, and this species is also known to occur in the Essequibo, Mahaica and Berbice river systems as well as the Courantyne, Coppename and Suriname drainages in Suriname. 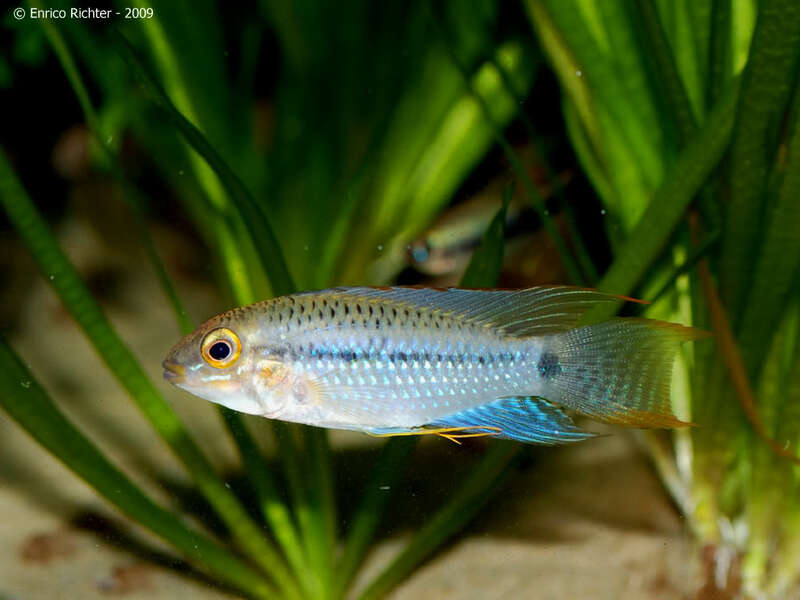 A very similar fish is also known from the Cuyuni basin, eastern Venezuela, though it remains to be seen whether it’s conspecific with A. steindachneri or not (see ‘Notes’). Slower moving tributaries and streams, typically with substrates covered in leaf litter and submerged woody structures. One locality in the Suriname River basin consisted of a forest creek containing very clear blackwater with a substrate of white sand, leaf litter and fallen branches. Electrical conductivity was measured at 58 μS/cm-1 and temperature 25.6°C/78.1°F. Sympatric fishes included Nannacara anomala, Krobia guianensis, Crenicichla cf. 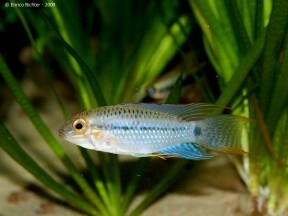 saxatilis, Laimosemion agilae, Carnegiella strigata plus various unnamed small characids. These can provide a valuable secondary food source for fry, while the tannins and other chemicals released by the decaying leaves aid in simulation of natural conditions. Alder cones may also be used for the latter purpose. There is no need to use peat, the collection of which is both unsustainable and environmentally-destructive. This species is less fussy than many congeners in terms of water chemistry though soft, slightly acidic conditions are preferable. In the aquarium live and frozen foods such as Artemia, Daphnia, Moina and chironomid larvae (bloodworm) should be offered regularly although most species will also learn to accept dried alternatives with pelleted products generally preferred to flake. Captive-raised fish are the recommended choice for the community aquarium. 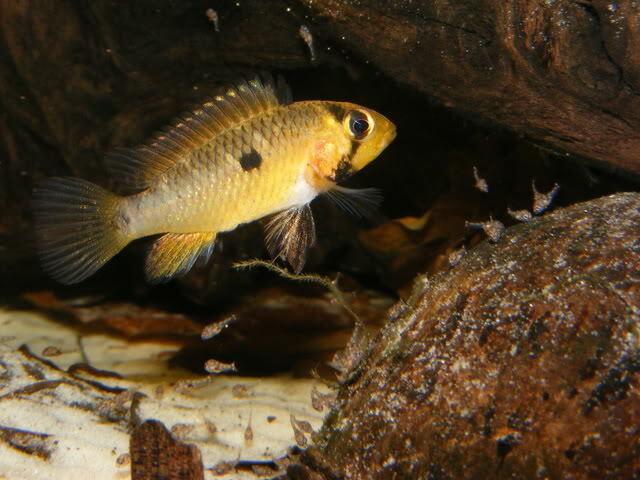 Wild examples are best maintained alone or with small ‘dither’ fishes such as Nannostomus spp., and ideally should not be mixed with other Apistogramma. Sexually-mature males establish territories and react aggressively to other males in the vicinity, though the presence of several females is normally tolerated. Post-spawning the male usually returns to protecting his larger territory and courting other females leaving the female to guard and tend the eggs and fry, although when maintained as a single pair he may help guard the fry once mobile. 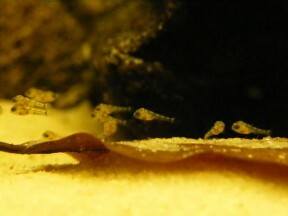 Depending on temperature the eggs hatch in 36-72 hours with the fry free-swimming after a further few days. The form from the Demerera drainage is assigned the code A138 under the DATZ system, with the Venezuelan variant referred to as A139. Following Römer (2006) it can be told apart from congeners by the following combination of characters: no abdominal stripes; presence of a single, triangular lateral spot located on, and only slightly broader than, the lateral body stripe; presence of a distinct round spot on the caudal-fin base; lateral stripe narrow and reaching caudal spot; dorsum scales often with a jet black posterior margin and blue or yellow anterior margin; ventral portion of body normally bluish. The A. steindachneri group, for example, is ordered within the larger A. pertensis lineage. 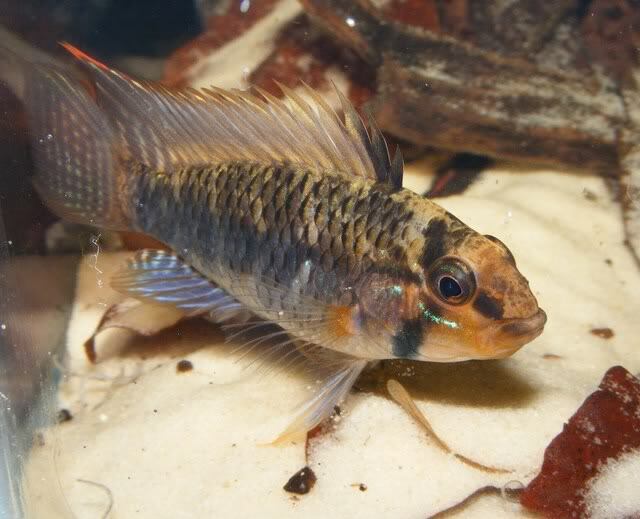 Description of a new cichlid fish of the genus Heterogramma from Demerara. 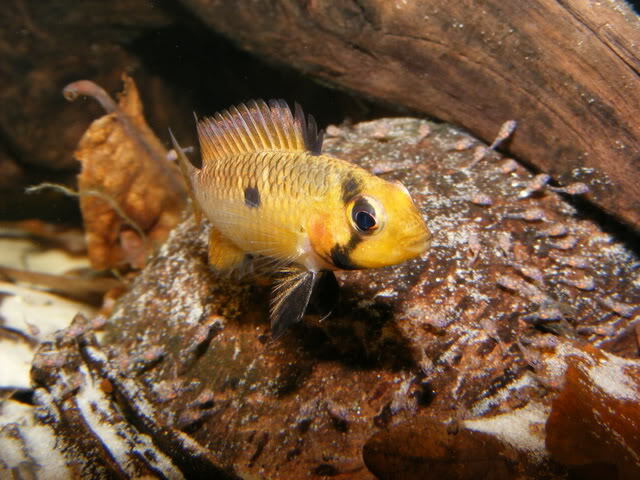 A taxonomical study of the genus Apistogramma Regan, with a revision of Brazilian and Peruvian species (Teleostei: Percoidei: Cichlidae).